We’d love your help. Let us know what’s wrong with this preview of Bulletproof Faith by Candace Chellew-Hodge. To ask other readers questions about Bulletproof Faith, please sign up. This book was really really really really really helpful while I was preparing to come out as bi. 💗💜💙 Honestly, it was vital. In a remarkable voice full of hope and wisdom, Candance Chellew-Hodge offers a spiritual survival guide for the GLBTQ community and its allies. With illustrative candid accounts from her own life, Chellew-Hodge sharply wedges a tool of self-defense in the slamming door of anti-gay sentiments, threats, and violence. Bulletproof Faith is an easy read, a loving read, actually. It is as much of a protective shield—coating the reader with images of a mysterious and perfect Creator—as it is an empoweri In a remarkable voice full of hope and wisdom, Candance Chellew-Hodge offers a spiritual survival guide for the GLBTQ community and its allies. With illustrative candid accounts from her own life, Chellew-Hodge sharply wedges a tool of self-defense in the slamming door of anti-gay sentiments, threats, and violence. Bulletproof Faith is an easy read, a loving read, actually. It is as much of a protective shield—coating the reader with images of a mysterious and perfect Creator—as it is an empowering how-to guide for healing from miscommunication, hate, and self-doubt. Chellew-Hodge’s work exudes confident and practical steps for those silenced and marginalized because of their sexual identity. She tackles how language is used to dehumanize the lives of the GLBTQ population, facing those who hate you, and the art of “surrendering” for true strength and peace. Chellew-Hodlge consistently advocates for trust, self-worth, and patience. Religion, particularly Christianity, is not always a central focus for mainstream feminism. I muse that it is the explosive nature of religion and religiosity that often restrains feminists to write on such issues, but religion’s Herculian-sized influence on our personal beliefs directly impact our thoughts and views of gender. Although not aimed directly at feminists, Bulletproof Faith is written as much for the spiritual survival for the GLBTQ community as it is a document for others on how to be an ally. I thought this was a great book. The concept of a bulletproof faith struck me as strange, initially, but the comparison of putting on the whole armor of God as a 1st century image and the need for something stronger now made sense to me. Chellew-Hodge writes for LGBT people about developing a strong, loving, non-defensive faith that helps in controversial moments, but her principles are great ones for all people of faith who are under challenge. She includes several spiritual exercises that have I thought this was a great book. The concept of a bulletproof faith struck me as strange, initially, but the comparison of putting on the whole armor of God as a 1st century image and the need for something stronger now made sense to me. "Bulletproof Faith" works best if one approaches it as a surface self-help book. As a tool for being a Christian who is less tuned in to those who attack you (for whatever reason) it offers helpful advice and some nice activities that you can do in order to be able to better handle the slings and arrows that others throw at you. 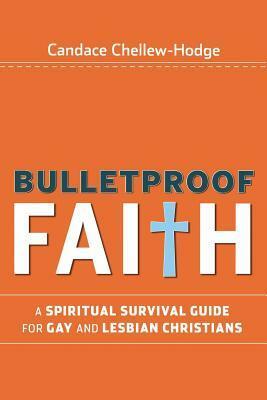 As a book that will "bulletproof" the faith of gay people who come from a strong evangelical background, it will be found lacking. Personally I found the book mostly help "Bulletproof Faith" works best if one approaches it as a surface self-help book. As a tool for being a Christian who is less tuned in to those who attack you (for whatever reason) it offers helpful advice and some nice activities that you can do in order to be able to better handle the slings and arrows that others throw at you. As a book that will "bulletproof" the faith of gay people who come from a strong evangelical background, it will be found lacking. Personally I found the book mostly helpful and I enjoyed Ms. Hodge's honesty in exposing her own warts and issues. She has a bad temper, and often feels the need to get in the last word. Knowing this about herself, and being honest about it, enables her to be very blunt and constructive with her readers who share the same faults. That is a very helpful element of this book. She is also very upfront about the fact that this text is not meant to give you scriptural ammunition to fight those who want to condemn homosexuality. It does not provide that, and with a few exceptions many of her scriptural analysis are not all that insightful. But her heart is clearly in the right place, and that goes a long way with me. I also liked how Hodge occasionally inserts into the text little excerpts that she calls "Spiritual Survival Exercises". These are meditations, prayers, and other helpful tools that she has used in her life to help her become closer to God, and having tried most of them some work for me, some don't. Ms. Hodge is just trying to jump start your prayer/thought life with God. However, there are also some flaws in the book that leave it and its subject matter vulnerable to criticism. It is there, as much as I wish it wasn't, and this does detract from the work. First off she uses some ridiculous examples to make her points. She quotes, and comes back to often, Xena the Warrior Princess to make one of her more salient points in the book. Besides being a stereotypical choice to use, it also reeks of pop culture. There are numerous Biblical examples that Hodge could have used to make the same point. There are also a few times where her arguments are very weak and not very sound. I know this because I am a friendly and supportive audience for her views, and even I occasionally rolled my eyes at some of her arguments. If I am doing that, what will her detractors do? I would hate to see the effectiveness of her message lost to such small things, but I am afraid for some people that is exactly what will happen. I actually really liked this one. While other books focus on textproof and stuff of that nature, Chellew-Hodge spends more time on how to see that attacks come from a place of fear and that they're other people's issues, not ours, which is great advice for any conflict. I like her advice on having a relationship vs being Right--all either side really wants is validation. The pop-culture references were cute, and for once I actually got most of them. The chapter on the Galatians verse was well do I actually really liked this one. While other books focus on textproof and stuff of that nature, Chellew-Hodge spends more time on how to see that attacks come from a place of fear and that they're other people's issues, not ours, which is great advice for any conflict. I like her advice on having a relationship vs being Right--all either side really wants is validation. The pop-culture references were cute, and for once I actually got most of them. The chapter on the Galatians verse was well done. She also makes the point that since love does conquer all, eventually, understanding and enlightenment will win the day, so the things people say and do today, this lifetime, are all heading towards that goal. I think that if I were GLBT I'd have gotten even more out of the book, and all positive stuff. I will be giving this book to my mother and asking her to read it. I will be offering it to my PoD mentor if he's interested. I'll be recommending this one generally. I think it's the zeal of a convert: because when it first arrived I wasn't entirely certain about it. I felt like I was beyond it. I felt like because my church is mostly-sorta accepting, I wasn't the sort of person that Chellew-Hodge was talking about. But the truth is, I am. And I needed to read this book, and I will need the meth I will be giving this book to my mother and asking her to read it. I will be offering it to my PoD mentor if he's interested. I'll be recommending this one generally. I think it's the zeal of a convert: because when it first arrived I wasn't entirely certain about it. I felt like I was beyond it. I felt like because my church is mostly-sorta accepting, I wasn't the sort of person that Chellew-Hodge was talking about. But the truth is, I am. And I needed to read this book, and I will need the methods of maintaining mental and spiritual strength. This book, for me, is on the level of Stephanie Dowrick in terms of its importance to me, only this is written for people so much like me. This is written for those of us who "don't exist" - queer Christians. People who have to keep standing up and saying "Here I am" because so many people think we don't or shouldn't exist. I found this a useful read for framing the dichotomy of needing to converse with people who are 'one the other side' but also to know when your conversation is fruitless and to break it off. As an Episcopalian its something I strive to learn and Chellew-Hodge breaks this down in some helpful ways. However, there is one notion she presents that makes me reluctant to recommend this book to other Episcopalians, queer and straight alike. On page 105 she says "A theology based on just Scripture, trad I found this a useful read for framing the dichotomy of needing to converse with people who are 'one the other side' but also to know when your conversation is fruitless and to break it off. As an Episcopalian its something I strive to learn and Chellew-Hodge breaks this down in some helpful ways. This is a life-affirming book that is true to the Christian faith. God's Will for all human beings is to love God and one another, not using others for our own sexual gratifications but to express our love and learn together to live life abundantly, grow up, pray, do good works to help our neighbors, recognize our tendency to fall short of the mark and seek forgiveness in order to carry on, "go and sin no more." "The only thing that counts is faith working through love" (Galatians 5:6). I encoura This is a life-affirming book that is true to the Christian faith. God's Will for all human beings is to love God and one another, not using others for our own sexual gratifications but to express our love and learn together to live life abundantly, grow up, pray, do good works to help our neighbors, recognize our tendency to fall short of the mark and seek forgiveness in order to carry on, "go and sin no more." This is a great guide to conflict resolution for GLBT christians. It teaches strategies that help you see the person you're dealing with as a human. It also provides good advice on how not to lose your cool and treat everyone with grace and reverence. And by conflict resolution I don't mean that you have to like and agree with everyone but that you're able to have a civil conversation (or at least know when to walk away). I'm not a Christian and I'd hoped from good reviews it might have some cross-cultural relevance, but it didn't for me. I mean, the advice about not taking hostility seriously enough that it impacts your quality of life is good, but I don't need to know that God still loves me because God's not a part of my life. Very good! Thank you for writing this. Loved it. Have read it twice and will read it again.